My antenna scrapes the door on the way in. I'm not sure of the door height but my 04 has a 3" body lift and higher TB keys along with the 33s. The bottom of the mirrors are 6" higher than either of our stock height avys. It's a tight fit for sure. Jon...you still use factory fuel pumps? That surprises me. You should modify a stock housing to accept Walbro pumps. its not stock now.....but not the good stuff. I'm to cheep to do that. Too cheap? With your skills I'm surprised you haven't built a bigger/better pump with old scrap parts you found lying around. McGyver! Ditto. And I'm still getting to know how she handles in this white stuff. The threshold for loosing traction is much bigger than I'm used to; not to mention the countermeasures that it employs. It jerks it back into alignment with authority. Yes, I'm black. No, I'm not an ignorant follower. Yes, I fear God. No, I don't support Barack Hussein Obama...just sayin... ;-) Acts 2:38 for LIFE. Yeah Tonka, the heck man. We just got a couple feet with a lot of wind. 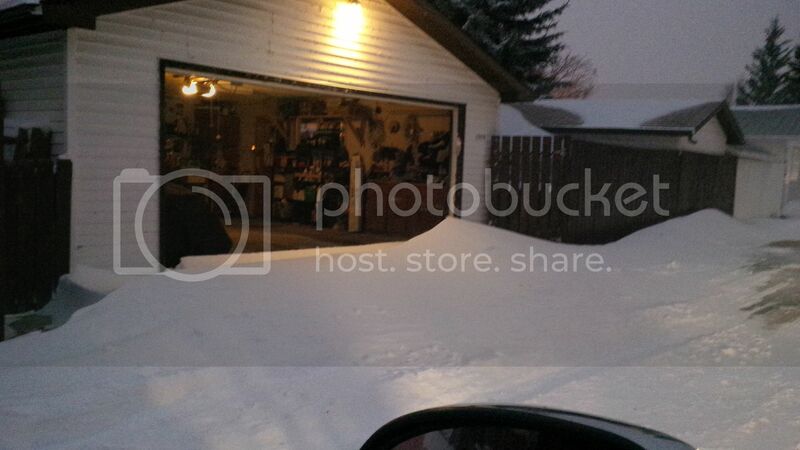 It doesn't look bad, but this snow bank when into my radiator when I drove in to the garage. But the truck is invincible with studded winter tires and 4x4. Jonnie mo I wish you could stop that below zero weather coming from your place next day or two..
You may have misunderstood, friend. What I mean is, in comparison to my '07 WRX, though AWD, and such a "better" (when dry performance counts) power to weight ratio, with performance tires, with no countermeasures; it's just a rocket, your driving skill and the worst that winter can throw at ya. Even a little too much throttle, and with all that torque it can loose traction in a second, if not wary. That's what I mean - in the Avalanche I can be so much more careless (for lack of a better term) and not fear paying the consequences since it's so much heavier, lower P to W ratio and it takes over when it thinks I'm mishandling it. Sooo.... I THINK we're on the same page. :-) Driving the AV in the winter is a vacation compared to balancing that turbo-charged machine. Brand new 4L65E and 2600 yank are going in today.... back on the road tomorrow.